Welcome to Holy Resurrection Orthodox Church, Tacoma Washington. We pray that your visit will be a source of blessing for you. Though our manner of Christian worship is centuries old, most Americans find it a bit different at first — but watch and listen, and the timeless beauty of heavenly, eternal worship will begin to reveal itself to you. Please, when you visit, don't worry about "doing the right thing;" we count it a sin to judge others while we pray (Luke 18:10-14). As you will see, we do like to stand in the presence of God, but if you need to sit, please do so! While the worship of the Holy Trinity is the very heart and foundation of our community and faith, we also find encouragement in fellowship with one another through our various parish activities. You will find that we simply enjoy being with each other! We are one of the oldest Orthodox Christian communities in the United States, and the first to use English exclusively in Washington. Having outgrown historic Holy Trinity church in Wilkeson, we have moved into our new home southeast of Tacoma city limits. Here, amidst ten beautiful acres of field and forest, we have built and have had to enlarge preliminary buildings as we grow and welcome more people to our faith. There is no hiding the fact that we are very excited to be a part of one of the fastest-growing faiths in North America, while at the same time a part of the oldest Christian Church in the world. Most of us were new visitors once, and most of us are converts to Orthodox Christianity! Whether you spend a morning, an evening or a lifetime, you will at least have come away with the experience of how, for centuries, countless millions of Christians have worshiped the Most Holy Trinity throughout Eastern Europe and lands around the eastern Mediterranean. It is a way shaped by the churches of Jerusalem, Antioch and Constantinople, a way inspired by Kiev and Moscow: now it is our turn in Pierce County, Washington, and we would be blessed to have you be a part of it! On Sunday morning we usually have 120 – 130 people in Church, many of them children. The beauty of Orthodox worship must be experienced to be understood. The Divine Liturgy expresses the entire Christian faith in a continuous song of praise and prayer addressed to God. It is focused on God, not on us. There is nothing just for amusement or entertainment. Since much of the service is the same every week, worshipers know it and can participate personally, either by singing along or just by prayerful attention. Worshipers are surrounded by icons (pictures of Christ and the saints), which remind us that we are participating while on earth in the worship of all the angels and saints in heaven. The entire service (except for the sermon) is sung to melodies and chants originating in Eastern Europe. No organ or other instruments are used, but an a cappella choir leads the people in singing. The words are all from Scripture or ancient Christian texts — no rhyming metrical hymns are used. Our services are in the English language. ◾Body Worship — Orthodox worship with their bodies as well as with words. You will see that people at times bow, make the sign of the Cross, etc. If you are not Orthodox, of course no one expects you to do these things — just sit or stand and listen, and participate to the degree that you wish. ◾Communion is understood by Orthodox as a sign of membership in the Church and an act of commitment to the Church, so it is not given to non-Orthodox. In fact, Orthodox should not receive unless they have recently been to Confession and have eaten and drunk nothing since the night before. Orthodox who are not known to the priest should speak to him so he will know they are communicants; just ask a member to send word to him. The cubes of bread offered in the large bowls are not Communion, but are like a fellowship meal, called antidoron. This is frequently given to visitors as a gift out of love. The bread is blessed and set apart before Communion and should be eaten reverently. ◾Standing (and kneeling) are the Biblical postures for prayer and Orthodox traditionally stand at Sunday services. But for most people this takes some “getting in shape”, so feel free to sit as much as you wish. We have enough seats for those who wish to sit. We don’t normally kneel on Sundays, as Sunday is the Day of Resurrection and kneeling is considered penitential; we kneel a good bit at weekday services during Lent. ◾Children — we don’t have a nursery during the services because we believe it is appropriate and beneficial for children to be in the services as much as possible. It may take a few visits, but young children can learn to settle down, and it’s surprising how much even toddlers absorb. It’s no problem if they move about quietly — we have a number of children ourselves and are used to some movement — but please be considerate and take them out briefly if they become very noisy, especially during the sermon. ◾Visitors Welcome — Orthodox try not to talk during the services, so it may be that no one will greet you until the service is over. After Sunday services we have Common Meal, a time of food and drink together in the Parish House; you’re invited to join us there so we can get to know each other. No one will put any pressure on you to join the Church; many people “visit” our Church for years. ◾The Eucharistic Prayer. We “lift up our hearts” to join the angels in singing Holy, Holy, Holy and offering thanksgiving (Eucharist) to God for all His works, especially remembering Christ’s saving work, and asking the Holy Spirit to transform our Gifts into Christ’s Body and Blood. It concludes with the Lord’s Prayer. ◾Communion. Orthodox who are prepared by repentance and fasting receive the Holy Gifts as a means of union with Christ. Our children receive because God’s work in us is not limited to what we can understand. 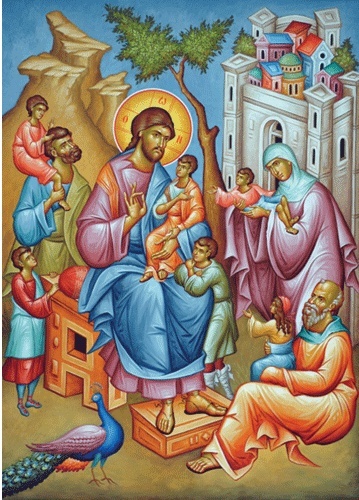 Icons are paintings of Christ and the Saints. They must be painted according to a strict tradition because they are an important way the Faith is handed down and taught. Icons and crosses are kissed (“venerated”), but not worshiped, as a sign of our belief that in Christ God took a physical body, and became part of our physical world so we could know Him. Other human beings who unite themselves with Christ become holy and the image of God becomes visible in them so we honor their icons, as well. We don’t hurry anyone to join; some people “visit” for years. We offer a repeating series of inquirers classes, check the calendar on our website for dates and times. There are no obligations to join while attending these classes. If, after learning the basic teachings of the Orthodox Faith, you desire to join the Church, then speak to the priest about becoming a catechumen (Greek for “learner”). The catechumenate is the initial stage of membership before the Orthodox Christian initiation rites of Baptism and Chrismation (anointing with sacred oil as the “Seal of the Gift of the Holy Spirit”). Along with special prayers for the catechumens during church services, they are taught the Christian disciplines of prayer, fasting, almsgiving and participation in the sacramental life. First Visit to an Orthodox Church? These following podcasts are made available by Ancient Faith Radio. They are just a few of the many podcasters that provide high quality 24-hour internet-based Orthodox radio including live music streaming, teaching, readings, interviews, lectures, conference recordings, live call-in programs, an extensive list of downloadable Orthodox podcasts and much more at AFR! Enjoy inspirational stories for Children of all ages read by Dr. Chrissi Hart, author of "Tea with the Queen", "The Legend of the Cross", "Under the Grapevine", and "The Hermit, The Icon and The Emperor". "Readings from Under the Grapevine" concentrates on Orthodox Christian books and other classic literature from a variety of sources. Hosted by Steven Christoforou, "Be the Bee" focuses on the various ways in which God has infused all of creation with goodness and beauty. The title refers to the metaphor of the bee and the flies that was used by Elder Paisios to describe how Christians should approach life. "Be the Bee" is a production of the GOARCH Department of Youth and Young Adult Ministries. Available in video and audio format. Father John Oliver’s series "Society and the Soul", from his podcast series "Hearts and Minds", is based upon “A Handbook of Spiritual Counsel” by Saint Nicodemus of the Holy Mountain, a work which examines the five human senses: sight, hearing, smell, taste, and touch, and the role that each one plays in acquiring or losing salvation.